"The chief difficulty Alice found at first was in managing her flamingo... just as she had got its neck nicely straightened out, and was going to give the hedgehog a blow with its head, it *would* twist itself round and look up in her face, with such a puzzled expression that she couldn't help bursting out laughing, and when she had got its head down, and was going to begin again, it was very provoking to find that the hedgehog had unrolled itself, and was in the act of crawling away." I was really quite pleased with this inexpensive and easy party entertainment for my Alice in Wonderland Tea Party. The croquet game is one of the most memorable parts of Alice's journey in Wonderland. (Also, one of the most relatable parts of Alice's adventures, in that curious Wonderland way. I know I have certainly struggled with flamingos and hedgehogs of sorts that simply refused to cooperate!) I wanted to incorporate the cricket game somehow into my tea party. Fitting a full-sized cricket match into a San Francisco Bay Area apartment with no lawn was obviously a no-go. I considered making my own tiny tabletop version of cricket. The mallets and balls didn't seem too challenging to craft, but I couldn't figure out an inexpensive and easy way to make hoops that stood up well. I was delighted to find this miniature croquet set on Amazon for $8.90. The set is designed for up to four players, so I ordered two for my party. Each box comes with two faux-wood mallets and four balls. 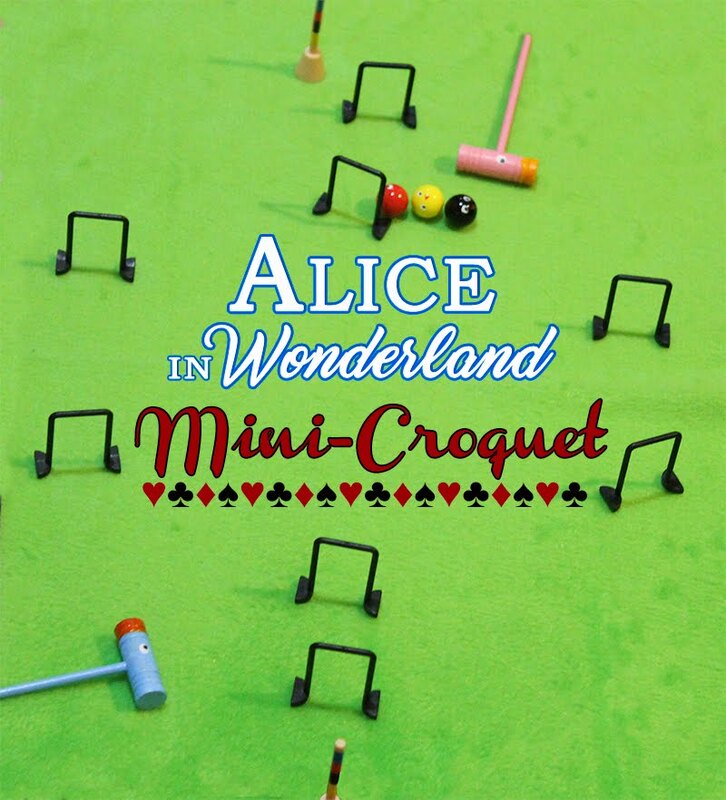 A perfectly adequate tiny croquet game - but not Wonderland-y enough for me! Fortunately, this was easily remedied - about 15 minutes of work with some acrylic paints. 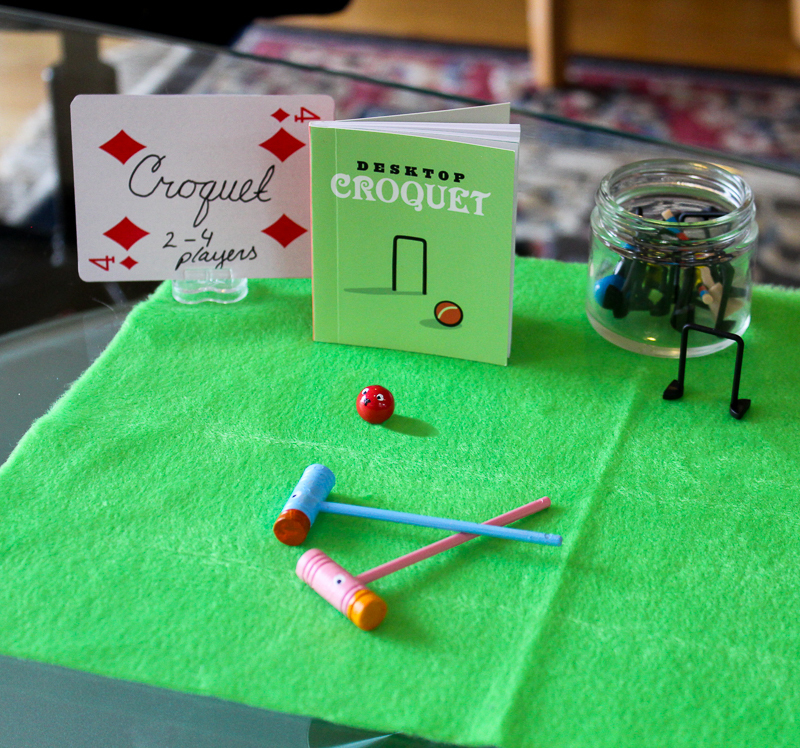 Unpack the miniature croquet set, and iron the felt "grass." It comes out a little wrinkly and the bumps can make it difficult to predict where your hedgehog will roll! Paint each mallet with two coats of acrylic paint in an appropriately flamingo hue. I went with the traditional pastel pink, as well as pastel blue and yellow. When the base color has dried, paint on a beak in a yellow or orange shade. Give your flamingo eyes with a little dab of white. When the white has dried, add pupils with a marker. Turn the balls into hedgehogs with eyes and a nose! Repeat step 4 for the eyes. With your marker, draw in a little triangle. Arrange the felt "grass" on tables for your guests to play on. Use a playing card to make a little instruction sign. Keep the instruction manual handy! Most of us are a little rusty on the rules. Store the tiny pieces in a small jar or bowl to keep them tidy. What pleasure find your site! I'm read again Alice's Adventures in Wonderland because in April'18 will be the second birthday of my son and I always dreamed of having a party whit this theme. My plan is do a simple tea party, just with uncles and grandparent's. So, do you have pictures, tips and ideas of the tea party that you have did? I'm Brazilian and not a english speaker, So sorry for any trouble. Comment again just for "notify me". Hi Mirra! I had so much fun with the Alice in Wonderland theme. For food, I did a classic Bristish high tea: mini sandwiches, scones, tiny pastries, little sweets (cakes, cookies, etc), etc. My favorite creation was the teabag-shaped shortbread cookies. I also made a cheshire cat for pin-the-grin-on-the-cheshire-cat. Have fun! And let me know how it turns out!